Like many US cities, Minneapolis is changing rapidly. Two months ago, as noted in NPQ, its city council approved Minneapolis 2040, a comprehensive planning document that makes Minneapolis the first large city in the US to abolish single-family zoning—a term that sounds innocuous, until one realizes that the tool has often been used in big cities across the country to support de facto housing segregation. Adoption of Minneapolis 2040 passed on a 12–1 vote, but no one should mistake the final margin with a lack of controversy. Now, the city is taking on another major issue: neighborhood associations. Minneapolis has many of them; the city’s 84 neighborhoods are served by 70 associations. Typically, members of neighborhood associations are civic-minded people looking out for the best interests of their neighborhoods. They often wield considerable influence; an article in NPQ in 2015 noted that 56 percent of city council members in the nation’s 50 largest cities reported meeting with neighborhood associations in the preceding month, significantly more than those who reported meeting with business associations or nonprofits. The city is considering tying municipal funding to the diversity of the associations’ leadership boards, which have been disproportionately made up of white homeowners. If they don’t hit representation benchmarks for renters, people of color and other demographics, associations could lose out on critical funding. The city is also asking associations to set bylaw requirements and term limits for board members, increase outreach and collaborate with other associations to save money. discussing what they would like to see for their neighborhoods moving forward. Despite the extensive consultation, some neighborhood associations, particularly the Northside Neighborhood Council, a collective of neighborhood associations in North Minneapolis, have voiced displeasure with the recommendations and claims that the process did not fully conform to the standards of an internationally recognized public participation framework adopted by the city. In a statement released on Monday, the group calls for several changes to the proposed recommendations, including creating an elected NCR board and funding for programs and staff. And then, of course, there are those diversity requirements. David Rubedor, director of engagement for NCR, explains the city’s reasoning, “We want our neighborhood organizations…to really reflect the diversity of their community. Not only in the programming and the activities that they do, but also in their leadership.” Under the plan, associations with boards that do not reflect neighborhood demographics would be put on a diversity action plan. 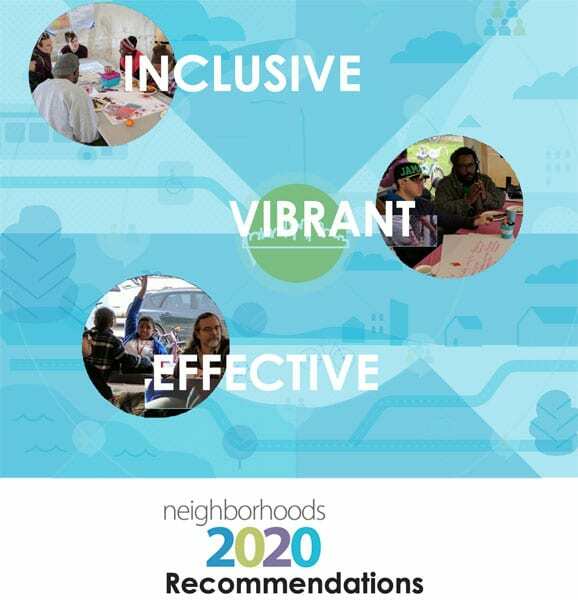 Created in partnership with NCR, neighborhood organizations would be expected to outline strategies and tactics to recruit members of diverse gender, race, age, income, and homeowner/rental status. Failure to develop a plan or meet goals could mean eliminated or reduced funding. Steve Fletcher, a city council representative for downtown and parts of northeast Minneapolis, tells Jessica Lee in MinnPost that “the council’s newly elected members are committed to broadening the type of people who interact with City Hall,” citing Neighborhood 2020 as a key example of the city’s new approach.